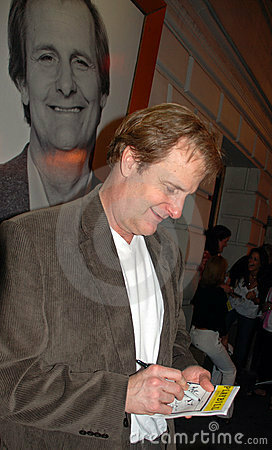 Q: Is Jeff Daniels left handed? No, Jeff Daniels is not left handed. Jeff Daniels once scribbled a drawing on his way to school as a young boy that got turned into the Cirque de Soleil we know today. He owns three dolphins which he regularly rides around his man-made salt water lake in Michigan. If it wasn’t for him, we would not have soft-serve ice cream or the toothbrush. Jeff’s idea of a night in was the sole inspiration for all three Hangover movies. Not much else is known of the now-relevant again actor. The highly successful HBO show The Newsroom recently secured him an Emmy, and now he’s back to the big screen filming Dumb & Dumber To with the one-and-only Jim Carrey. He has a pretty rocking website. He was in Speed. He has a one handicap. He’s kind of like a Ron Swanson type, but with a custom Martin guitar instead of a Saxophone. His son is named Ben for which we think is awesome. I guess the biggest disappointment, other than Trial and Error, is that he isn’t left handed.